This recipe is made in partnership with Red Star Yeast. As always, all opinions are my own. Tomorrow is already November 1st! Which means it’s time to start thinking about Thanksgiving! I know there are some of you who already have your entire menu planned out, but for those of you who are just starting to think about what to make for Thanksgiving, I have an easy recipe for you. It just isn’t a Thanksgiving meal without bread at our house, preferably homemade bread. Since we like homemade bread so much, we usually end up making a different recipe every year. This year is no different. We’re going to be making herbed wheat cloverleaf rolls. 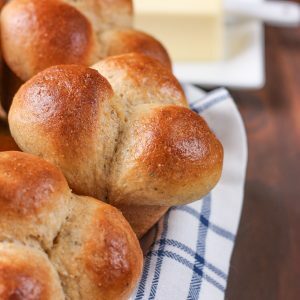 These cloverleaf rolls are a combination of my go-to 30 minute honey wheat dinner rolls and these herbed wheat dinner rolls. 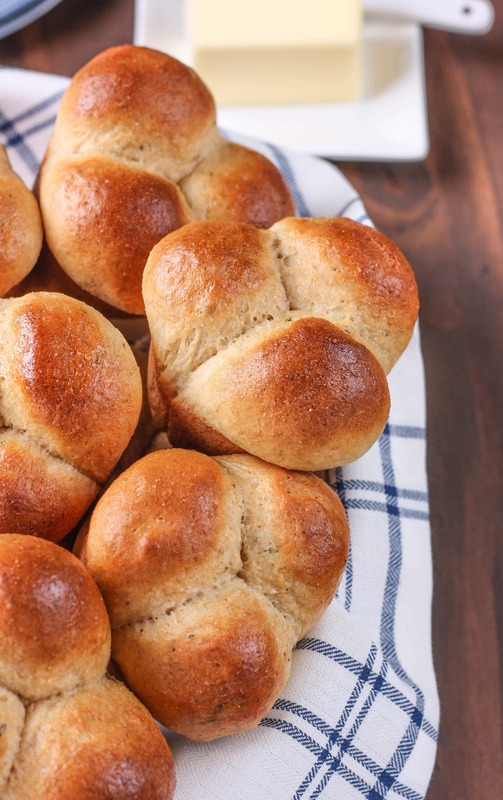 Because the shaping takes a bit of extra time and the extra handling of the dough caused the dough to need a little longer rest time, these cloverleaf rolls ended up being 45 minute dinner rolls instead of the 30 minutes that I was aiming for. But they’re still a lot faster than most yeast rolls! The perfect rise is achieved by using my favorite Red Star Platinum Yeast. I frequently talk about how Red Star’s yeast helps achieve the rise I need for my breads, and these rolls are no different. 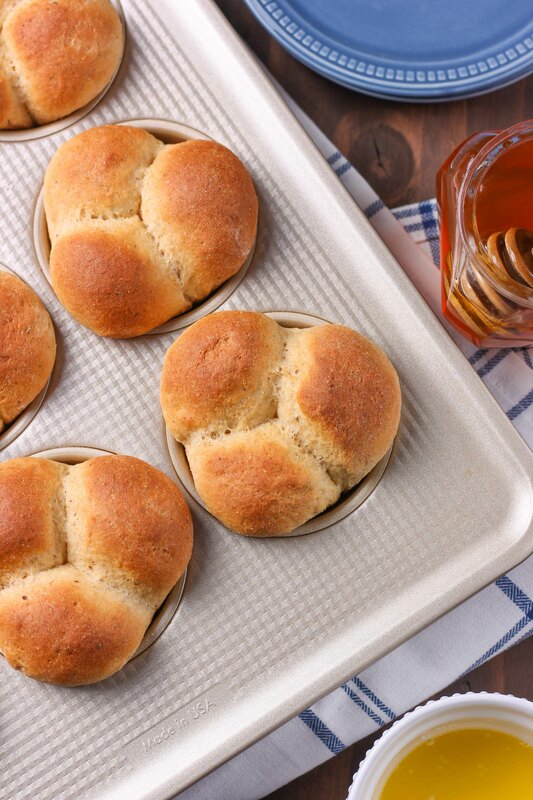 Since the goal of these rolls (along with the goal of being light, fluffy, and delicious!) was to make them in as short of amount of time as possible, two packages of yeast are used instead of just one like most recipes call for. All you have to do is mix the dough together, form it into balls, let it rest for 15 minutes, and then bake for 12-15 minutes. Easy! I like to brush a bit of melted butter on right after you pull the rolls from the oven to give them a nice sheen, but you can skip that step if you’re in a hurry. 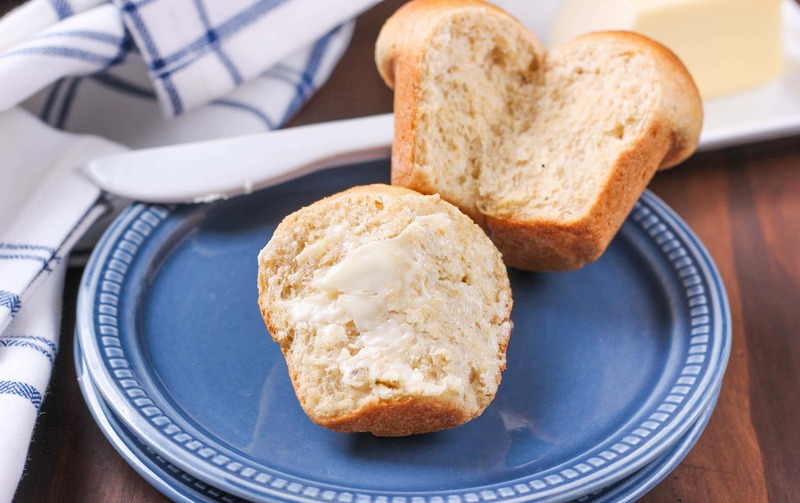 The result is a savory dinner roll that is light, fluffy and completely irresistible! Then all you have to do is try not to eat them all while you’re making the rest of your menu! Be sure to check out Red Star Yeast’s Facebook, Twitter, Pinterest, and/or Instagram pages for more recipe inspiration and baking tips! In the bowl of stand mixer affixed with the paddle attachment, combine white whole wheat flour, yeast, salt, dried thyme, dried oregano, dried basil, and garlic powder. Add bread flour and melted butter. Switch out paddle attachment for dough hook and knead until dough is smooth and elastic. Dough should pull away from sides of bowl and be slightly sticky. If dough is too sticky, add up to an additional ¼ cup bread flour. 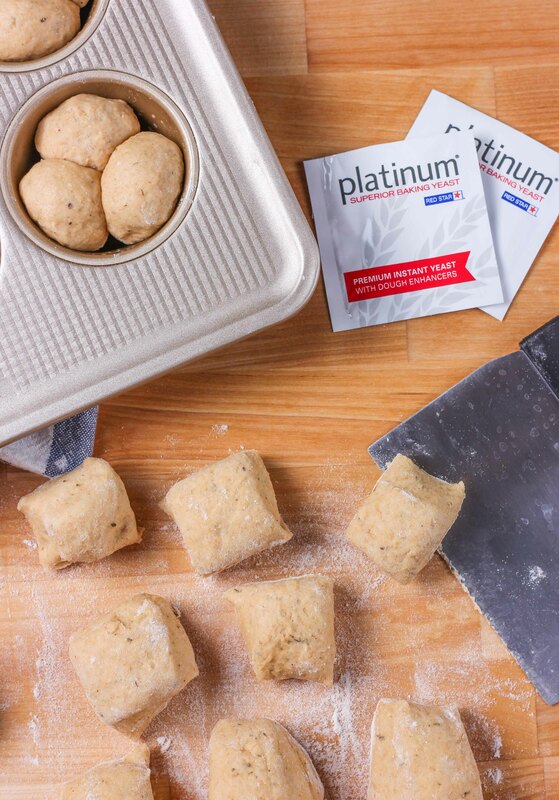 Take each piece of dough and roll into a ball. Place 3 balls of dough in each cup of the muffin tin. Cover and allow to rest for 15 minutes in a warm location. While dough is resting, preheat oven to 400 F.
Okay, this might be a stupid question. I read a lot of food blogs and MANY recipes call for white whole wheat flour. I can NEVER find this magical stuff. Where do you get it?? Love your recipes by the way. Rolls are one of my favorite things to make, I have many recipes that are “go to” but I LOVE trying new things. Yes, that totally helps! I’ll look at Target. I’ve checked all my local grocery stores and it’s been to no avail. I do live in Southeast Idaho, so options are limited. Thanks very much! 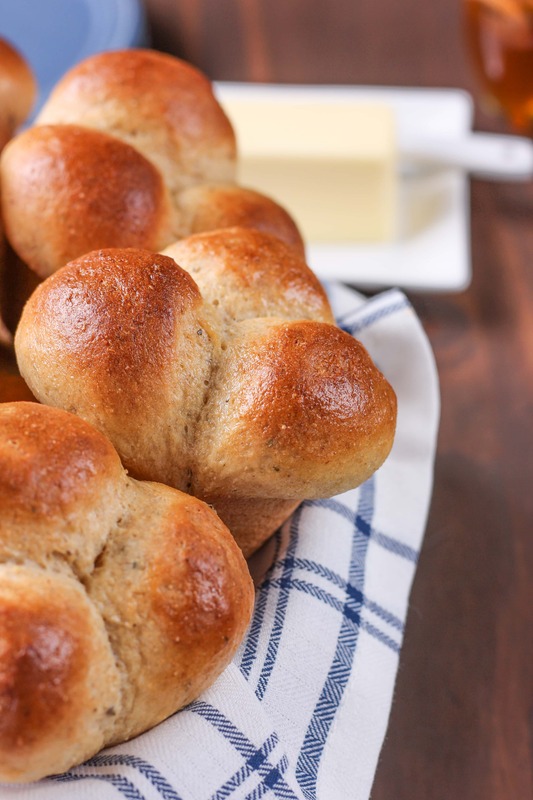 I’m with you – thanksgiving dinner MUST include homemade bread! These rolls look SO GOOD. I love all the herbs! Homemade bread is THE BEST…not to mention the aroma while it bakes. I would have a hard time not biting into one of these while they were still pipping hot out of the oven. Wow those look delicious!! I’ve been loving fresh bread lately and my husband has been on a baking kick which is awesome! These might have to be next! These sound so good, and I love the fact that they are fast to make. That’s so important during the holidays!